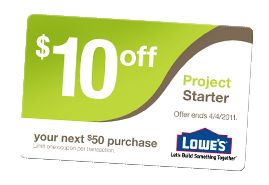 Hurry over and get a printable coupon for $10 off your next purchase of $50 or more at Lowe’s Home Improvement stores. This is awesome for all of us that have spring cleaning projects or flowers we want to get in the ground!! Remember most Home Depot’s will also accept this as a competitor coupon.